If you're trying to make better choices during the holidays and stay at the top of your game so you can enjoy all the entertaining, shopping, and festivities of the season, then we're on the same page. What if you are planning a holiday party? We challenged ourselves to plan an affordable healthy holiday party with easy to make decorations, a gluten-free menu with lower sugar, and that looks great. What do you think? Did we nail it? The other day, I shared about how we're giving smaller quantities of baked goodies as gifts this year. There's a way to still enjoy delicious drinks, snacks, and conversation without eating “rabbit food”. Being smart about and conscious of the choices we make during the holidays doesn't stop at sweets. What's the good of sharing a party spread if we don't share how we did it?! 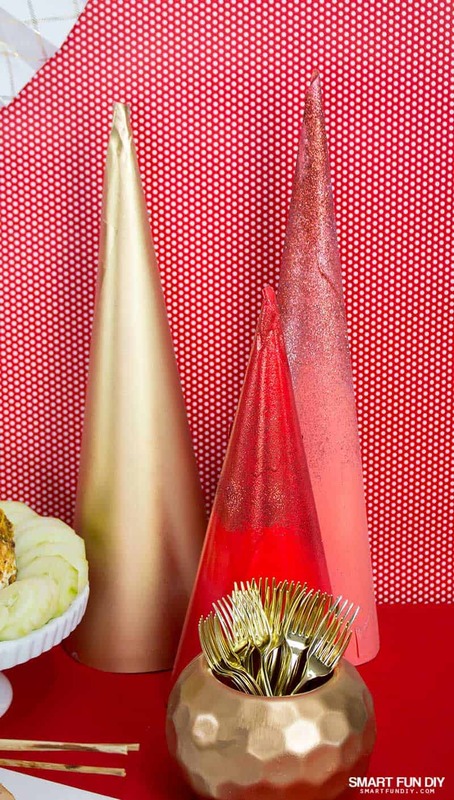 Let's dig into the menu for this healthy holiday party and then we'll share how we created the party backdrop, decor, and table top trees using supplies you probably already have in your kitchen and garage. 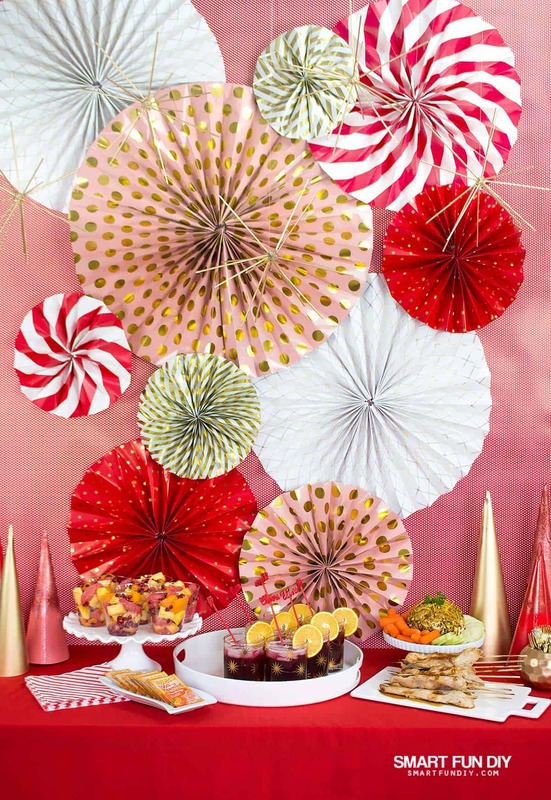 You could actually decorate this entire party for $0 by using what you already have! I thought a long time about the food at parties I've attended and parties I've thrown. The best parties had fresh yet delicious food options that tasted great and made me feel good after eating them. And I mean feel good physically but also feel good about the great choices I made. Feeling good is really what's cool about the holidays, right? Time with friends and family, making memories, and giving gifts to celebrate the reason for the season are all about feeling good, at the base of it. 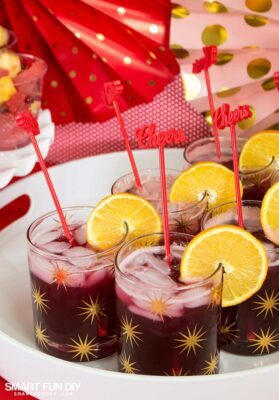 That's why the star of our healthy holiday party is a festive, delicious Cranberry Orange Spritzer. This drink is so easy to make and it gets its orange flavor from a secret ingredient that I love the taste of: Emergen-C Super Orange 30 CT*! Who doesn't love a fizzy holiday drink? 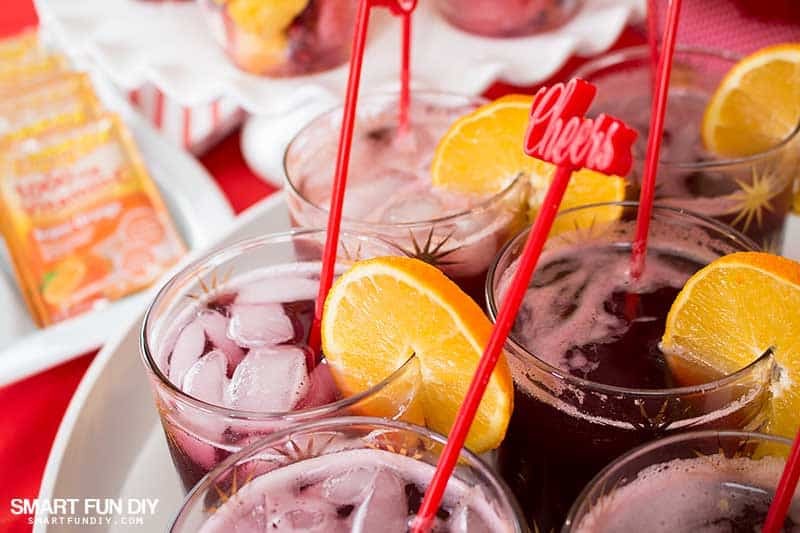 To create this smart party drink, lay out Emergen-C packets on a platter alongside a carafe of cranberry juice, a bottle of sparkling apple cider, and an ice bucket. Each packet is labeled with directions and supplement facts so guests have easy access to this info. Empty one packet of Emergen-C Super Orange into a glass. Add 1/4 cup water (about 1″ in these glasses). Stir with a swizzle stick to mix. Allow the fizzing to settle. Add ice to fill the glass to half. Add 1/4 cup cranberry juice. Add 1/2 cup sparkling apple cider. Stir and garnish with a fresh orange slice. Yum, right? 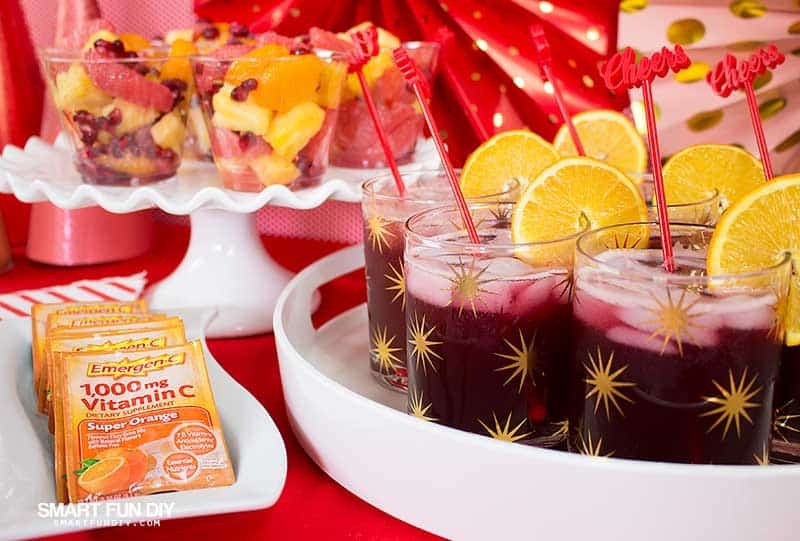 In this one drink, get energized by all the flavors of the season packed with essential nutrients, electrolytes, and Antioxidants and still have a great time at the party. This yummy non-alcoholic holiday party drink has a surprise … it helps your immune system too! Add 1 part water (about 1″ in these glasses). Add 1 part cranberry juice. Add 2 parts sparkling apple cider. For the vegetarian guests, we created a Tropical Ginger Orange Cheese Ball recipe. Cheese balls are a holiday party staple. Level up your cheese ball game with this zesty, tangy, sweet cheese ball recipe which compliments the flavors in the Cranberry Orange Spritzer. The orange zest and crushed pistachio on the outside of the ball give it a fresh, crisp taste that's light. Serve it with fresh chopped carrots, cucumbers, or other veggies for a gluten-free snack. Oranges are a special winter treat and living here in Southern California, we are surrounded by citrus trees. As a nod to our locale, we created a super easy Pomegranate Citrus Salad recipe with fresh grapefruit, mandarin oranges, pineapple, and pomegranate arils. Mix the fruit together and spoon into individual cups to serve. The pineapple compliments the tart grapefruit and the oranges with pomegranate arils give it a holiday flavor. We also prepared Orange Peanut Satays with a garlic sauce that's amazing! We grilled skewered chicken breast pieces after marinating them in fresh ginger, coconut aminos, and orange juice. Then we drizzled them with a homemade garlic orange sauce so they'd be ready to eat right off the platter on our party spread. We'll be sharing the recipes for the Tropical Ginger Orange Cheese Ball, Pomegranate Citrus Salad Cups, and Marmalade Chicken Satays here on the blog next week so be sure to check back for those! I posted a sneak peek of this party spread on Instagram and a few people guessed it … we made this entire backdrop with wrapping paper! 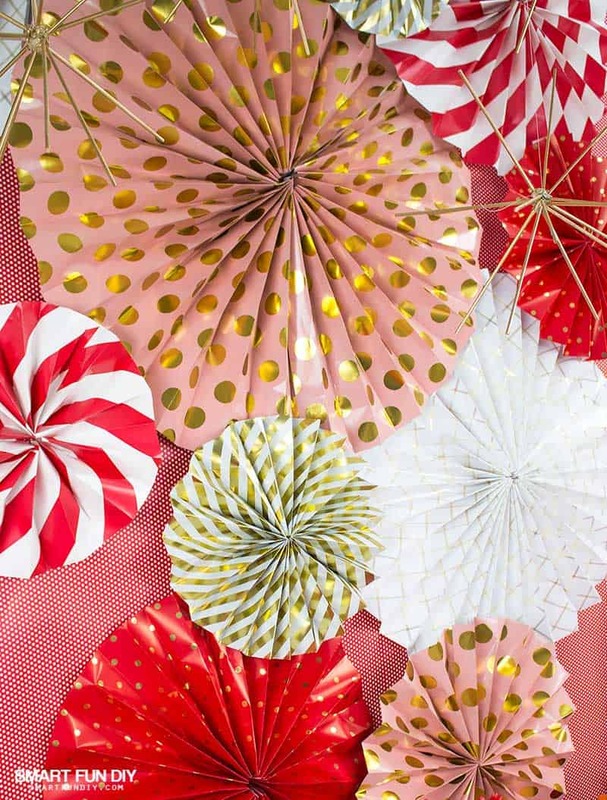 You're already buying rolls of wrapping paper for the holidays; why not use it to make coordinating party decor? If you live in the southwest United States, then you probably have awful textured walls in your house. All those cute vinyl murals and wallpaper scenes people are putting on their walls are a no-go for us because all the walls here have orange peel, knock-down, starbursts, or another texture on them. 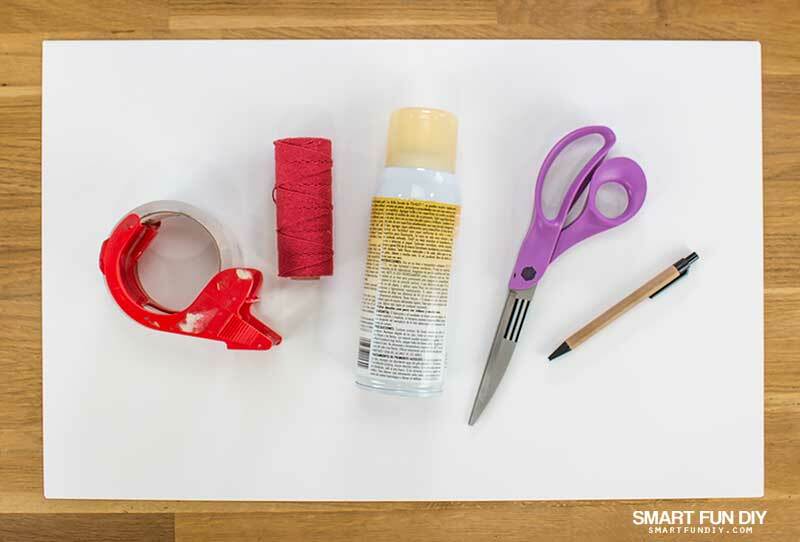 Covering the wall with wrapping paper is affordable, easy, and customizable to any occasion. Best of all, it's temporary so if you don't want to paint or live in a rental where you can't paint, no problem. Technicolor up the wall with wrapping paper! We've been using wallpaper on our walls for years, like last year when we took silly Christmas sweater photos. But that was another party, another day. We covered the wall with wrapping paper and then made folded paper rosettes from other patterns of wrapping paper to cover the wall to add dimension to the scene and help reduce the shine on the wrapping papered wall. 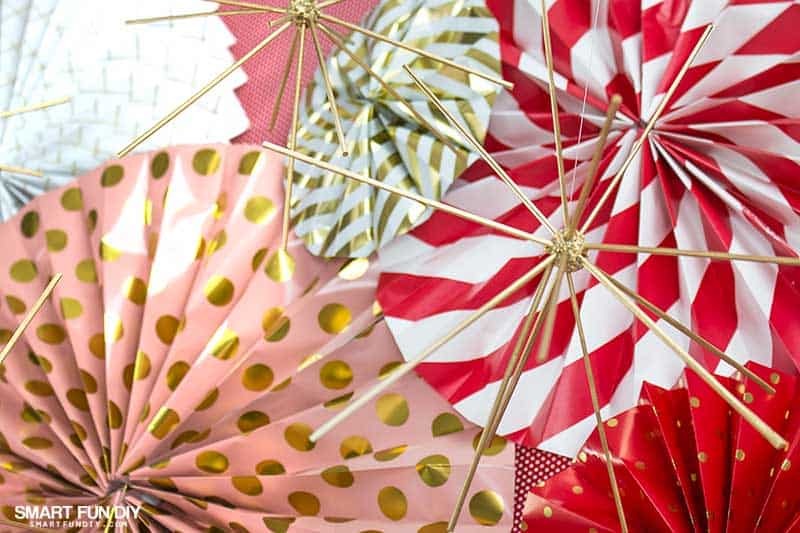 Next, I folded poster board into cones, spray painted them, and added glitter with spray adhesive. Okay, maybe you don't have spray paint in your house or spray adhesive like me but you can easily pick both up at Walmart. Who knew, right?! 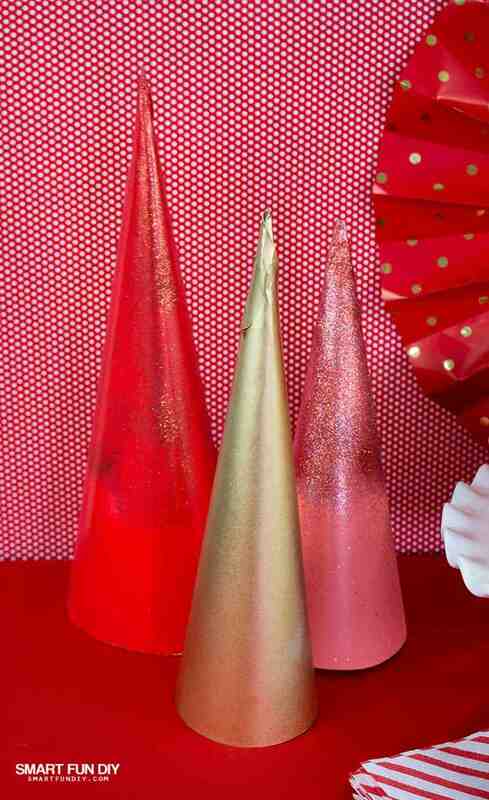 Try using wrapping paper or kraft paper to make the cones instead of poster board if you want taller cones. 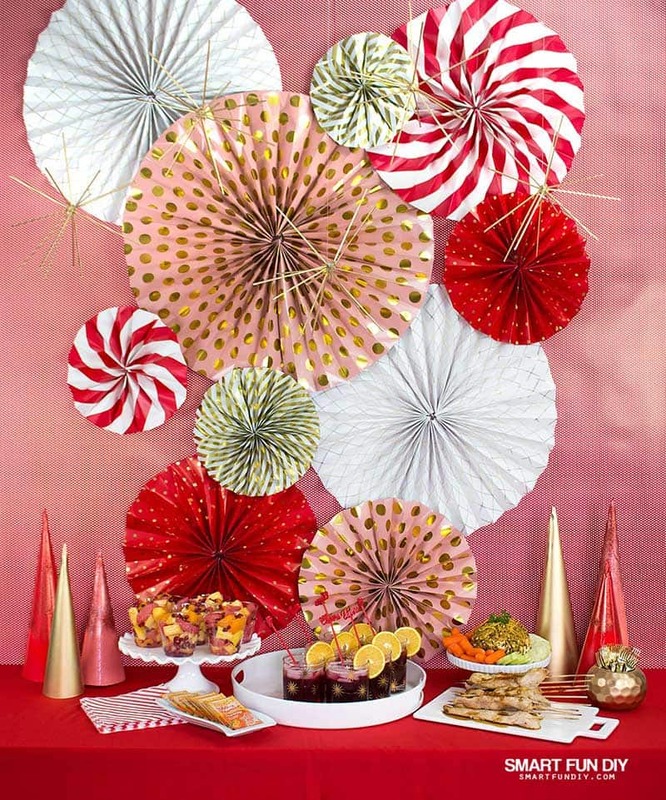 I have been loving the metallic starbursts that are on trend for table top and wall decor the last couple years. They're heavy, expensive, and hard to find in bulk but I really wanted to hang some from the ceiling. Grab a handful of bamboo skewers from the kitchen, tiny foam balls, glue, and gold spray paint and make your own. I hung these from the ceiling with fishing line and push pins – easy peasy! For decor that won't be used for food, you can use spray paint to change the color to match your decor. We spray painted this small flower pot gold to match the party and used it to hold mini forks. I covered the table with a few yards of fabric, also from Walmart. 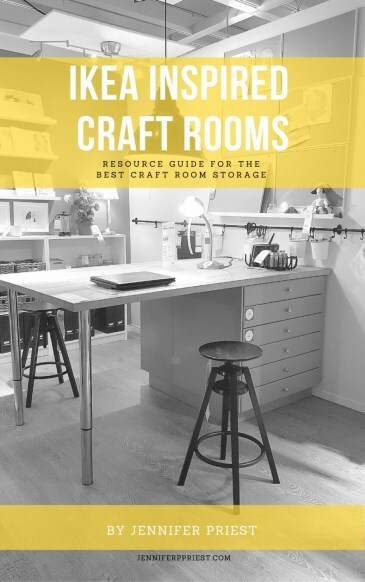 It's more affordable to buy fabric in every color you need rather than buy tablecloths. 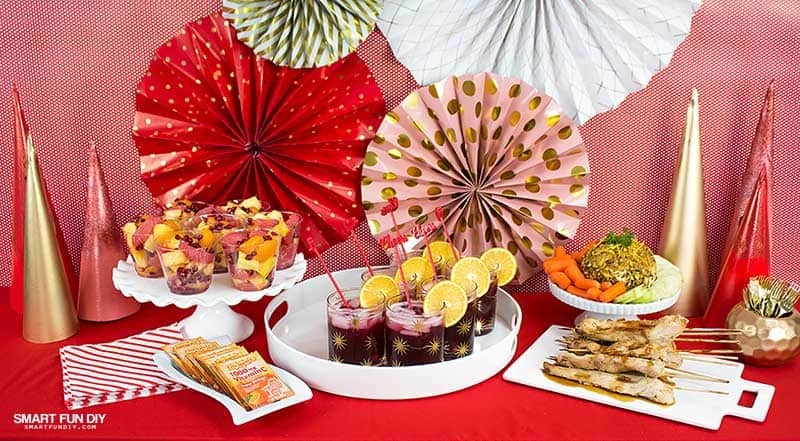 We planned the party around the colors of the food we were serving: corals, citrus, golds, and reds. 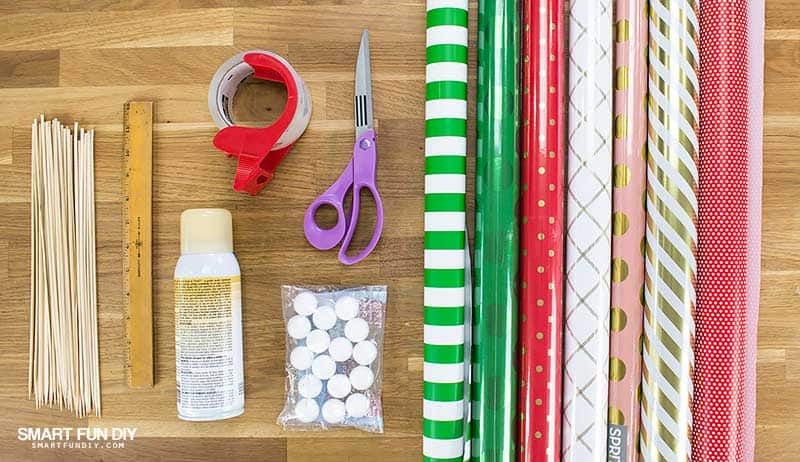 While in Walmart, choose four to five rolls of coordinating wrapping paper. We laid them across the cart and then added and removed rolls until we got the look we wanted. I knew I already had some red wrapping paper at home from last Christmas so I chose new rolls with that in mind. We also made sure the wrapping paper had pops of white since all of my party serving platters are white. Throughout the year I look for white serving dishes in unique shapes that I can use for parties and serving food since white goes with everything. Once you've decided on a color scheme, select coordinating spray paint and glitter if you don't already have it at home. You can match everything right in the store at Walmart to make sure it all coordinates before you buy. The next step is to put it all together. All you'll need are some push pins. Yeah, seriously! 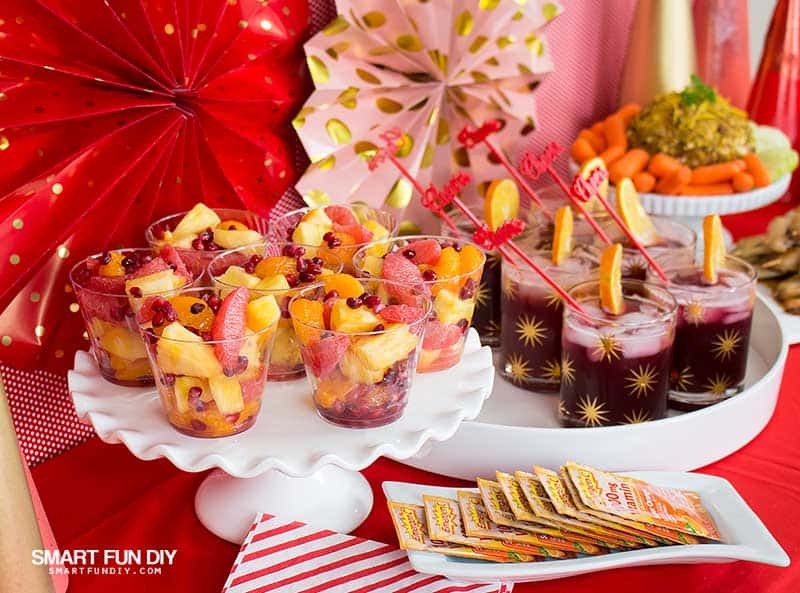 Add the food and you've got a festive, healthier holiday party that everyone can enjoy! What's your best holiday party tip? 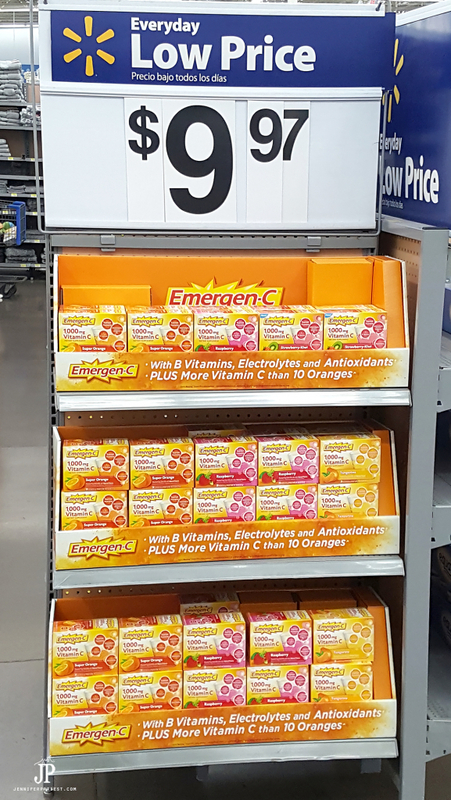 What drink recipe would you upgrade with Emergen-C? Let me know in the comments! Pin this to make it later! Very Festive – did you have recipes?? Thanks for sharing at the What’s for Dinner Link up! What a fun party and a great recipe! Thanks so much for sharing your awesome recipe with us at Full Plate Thursday! Hope you are having a wonderful week and hope to see you soon!